I liked this book. I picked it up mostly because it was published by Disney-Hyperion and I’ll be attending an upcoming conference with one of their editors. I always feel better if I’ve come with at least one of their books read. Possibly I’ve read more, but nothing comes to mind. Anyway, I started another book from that publishing house, put it down, and picked this one up. 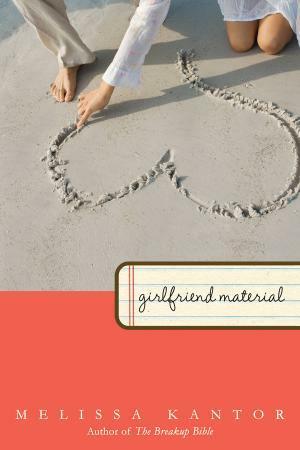 Girlfriend Material was a light and breezy read. I liked how Kate, the main character, struggled to understand what it meant to have a boyfriend and be a girlfriend. I think this book will ring familiar with girls who are new to the realm of actual relationships with guys. And Adam is a fun guy to follow around with Kate. Some parts of the book were quite funny, and while at first I was kind of pissed that the storyline with Kate’s mom wasn’t resolved, I later decided that I liked it better that it hadn’t been resolved. Tammara, if you are reading this, I recommend this book to you. I believe it would hit the spot for you: romance with a small side of steam paired with a bit of family drama, and finishing with bit of humor and sweetness. Next, something meatier: Where She Went, by Gayle Foreman. If you haven’t read the prequel, If I Stay, I highly recommend it. Wondering if I should re-read it before digging into the next one. It was my favorite book of 2009, even though I’d completely brushed off the idea of reading it because, ohmygodnotanotherbookaboutdeath! Glad I found that signed copy in the used book store that night in Ann Arbor. I have to read the Gayle Forman books. I’ve heard so many good things about them. Have fun at the conference and tell us all about it.